Location: Home of Chloe Ramsey, Bald Mtn. Road, Bee Log, North Carolina. Drafted by Barbara Webster and painted by Tina Leskovic and Sharon Denning. Installed by Ray Greene, Steve Grindstaff and students of Mountain Heritage HS. Donated by Charles and Becky Gillespie to honor Chloe and Glenda Ramsey. 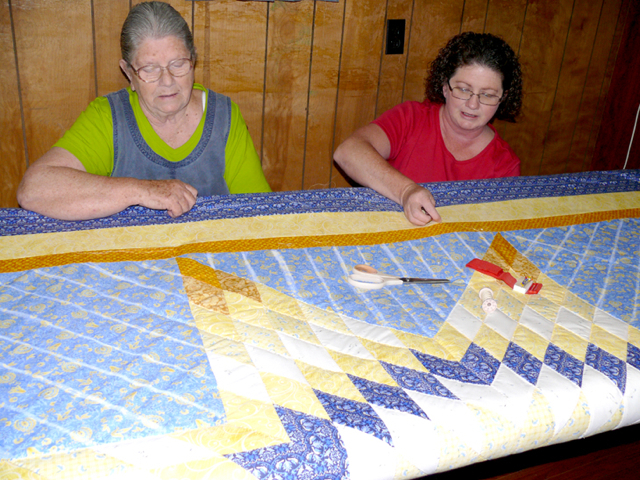 Years ago, Chloe Ramsey and her youngest daughter, Glenda, residents of the Yancey County community of Bee Log, were hired by Becky Gillespie, a Burnsville quilt shop owner, to piece and stitch quilts. Chloe and Glenda quilted on a big quilt frame suspended from the ceiling in their basement, surrounded by shelves filled with mason jars of food canned from their big garden. Occasionally Becky would take a quilt to Montreat to donate to their Gift Shop. One of Chloe and Glenda’s quilts made for Becky, an Ohio Star pattern, was donated to the Montreat gift shop and subsequently purchased by Ruth Graham, wife of evangelist Billy Graham. Rev. Billy Graham ended up giving the quilt to Pope John Paul II. That Yancey County quilt continues to reside at the Vatican. To honor Chloe and Glenda, Becky and Charles Gillespie had the Ohio Star block painted in the colors of that original quilt and the block can now be seen on the Ramsey home in the Bee Log community on Bald Mountain Rd. 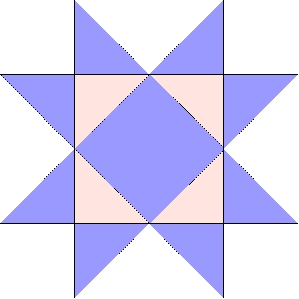 Posted on March 24, 2011, in Quilt Blocks., Supporters & Sponsors., What's the impact? and tagged Ohio Star, Pope John Paul II, Yancey County. Bookmark the permalink. Leave a comment.